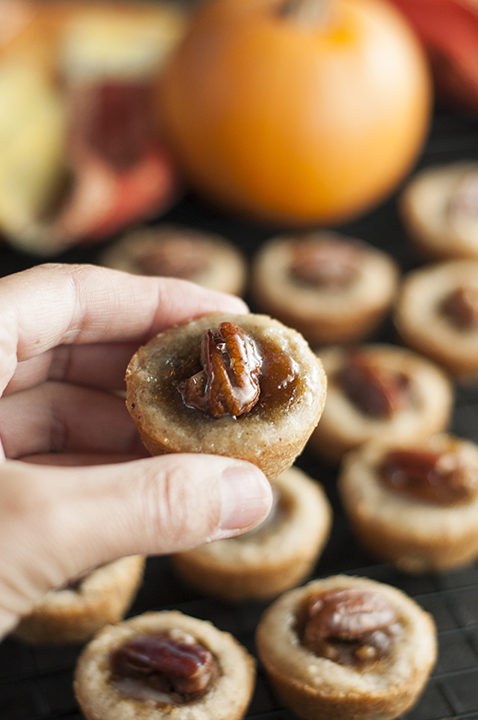 Mini Pecan Pumpkin Pies holiday dessert recipe is all that is wonderful about the holidays rolled into one bite size treat! No need to choose between pumpkin pie or pecan pie anymore! It is super hard to believe it’s that time of year again but the holidays and holiday food are upon us. I woke up to white stuff on the ground the other day, so there’s that. Now don’t hate me, but I am just not a huge pie person. 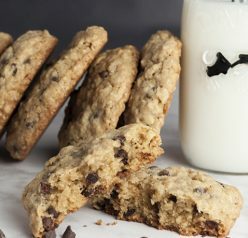 They aren’t my favorite dessert of all time and I would much rather grab for the cookies or a slice of cake (as long as it’s not chocolate). I feel like maybe I was wired wrong – no chocolate and no pie? Yeah, I’m messed up in the head. However, I will totally go for a peanut butter pie or banana cream pie…probably because they make your teeth hurt from their glorious sweetness. Totally worth it. 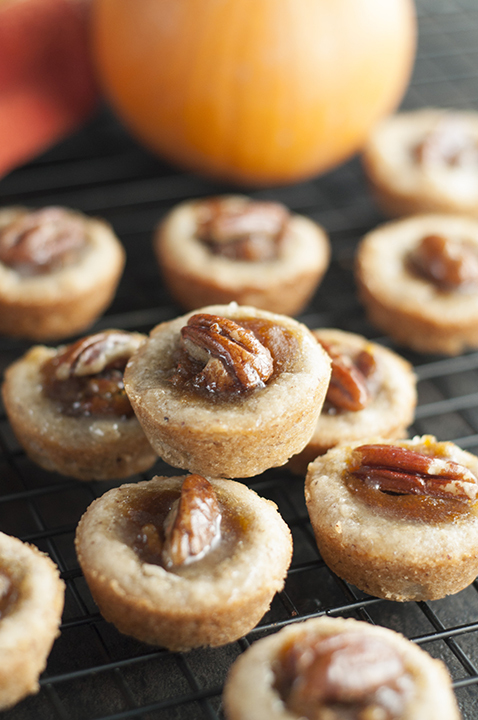 These Mini Pecan Pumpkin Pies are where it’s at. I also don’t normally go out of my way to make pies. I just don’t have the pie crust gene and they are pretty high maintenance. 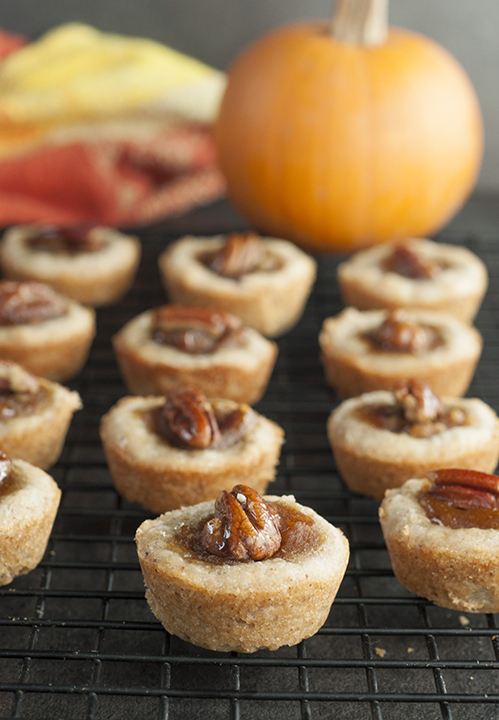 These Mini Pecan Pumpkin Pies take the work out of making the perfect pie crust and worrying about chilling it, rolling it out. etc. Yet, you still get the amazing pie taste! Your guests will love this dessert option on your holiday tables this year. Since these Mini Pecan Pumpkin Pies are mini size, you can eat 10 of them and have no regrets at all, right? These are the perfect tasty, sweet treat to enjoy after your enormous, fattening Thanksgiving meal that’s bound to happen soon. Warning: these bite size treats are a lot easier to just pop in your mouth and move on with life, so proceed with caution. For more Thanksgiving dessert recipes visit this page. My Pecan Pie Bark is calling out your name! Check out my how-to video showing the steps in making this Mini Pecan Pumpkin Pies recipe! Mini Pecan Pumpkin Pies dessert recipe is all that is wonderful about the holidays rolled into one bite size treat that combines pumpkin and pecan pie! Preheat oven to 350 degrees F. Spray the mini muffin tins with non-stick cooking spray. In a food processor, pulse the pecans, sugar, salt and flour until the nuts are ground and the ingredients are combined. Add in the ice-cold butter and pulse until dough resembles coarse meal. Slowly pour in the ice water through the feed tube until the dough comes together. Remove from processor bowl to a clean, floured work surface. Form the dough into a ball and divide evenly into 24 pieces. Lightly flour your hands if dough is too sticky to work with. Roll each piece into a ball and evenly press into each cup until the bottom is covered. Bake 15 to 17 minutes, or until the crusts are golden in color. Check periodically to make sure they don't get too brown. Make the filling while these are baking. In a medium bowl, whisk the egg , egg yolk, corn syrup, sugar, pumpkin pie filling and vanilla. Stir in the chopped pecans. Remove the dough from oven and spoon approximately 1 tablespoon of the filling into each cup. Top each with 1 pecan half for garnish. Return the pans to the oven and continue baking for an additional 12 to 14 minutes, or until the pumpkin filling is set. Allow to cool completely before removing from the pans. Use a knife to help pop them out of the pan if needed. Enjoy! 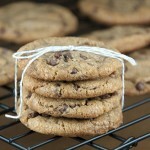 *Tip: I brushed a little bit of melted butter over the tops of these to make them shiny! I can totally relate to you. I feel similar about pie (and pie crust making) but these mini ones are perfect. I made something similar last year this time and I love how cute they are and how manageable, plus how good they look on a buffet table. The combo of pecan and pumpkin pie is fabulous! I do like pie, and always like mini pies. After all, it’s cool to say that you ate an entire pie! Or three. 🙂 These look like fun. And good! Thanks so much. One bite desserts are the way to go! I love these little bites! I can’t wait to make them for the holidays! I love mini desserts and pecan to boot. I’ve never been a big pie person either – I much prefer either cookie or bar versions of pies! These sound awesome! No pie and no chocolate cake?! I can’t even wrap my head around that one. 😉 For not being a pie person, these little cuties look downright perfect. We’ll talk about your feelings toward pie being high maintenance another time. I need you to visit for a Pie Class! There’s just something about mini desserts! These sound awesome and I ❤️️That the dough is easy enough. Can I tell you that you just made my night? Sometimes I feel like all I get are random complaints and never any compliments. Thank you so much for this comment…I really needed it this week!! I really really appreciate you taking the time to leave such nice words. Made these last year and they were a hit. 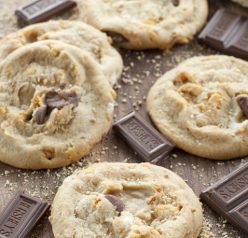 Definitely putting these on the holiday baking list again this year! Love anything pecan (and pumpkin) this time of year!